Mr. Menon is a technology executive in Silicon Valley, California. He is an avid audiophile who enjoys simple, high performance audio systems on which to enjoy his collection of vinyl and digitally streamed classic rock and Indian music. When Mr. Menon purchased a new home, a key requirement was a dedicated listening room. 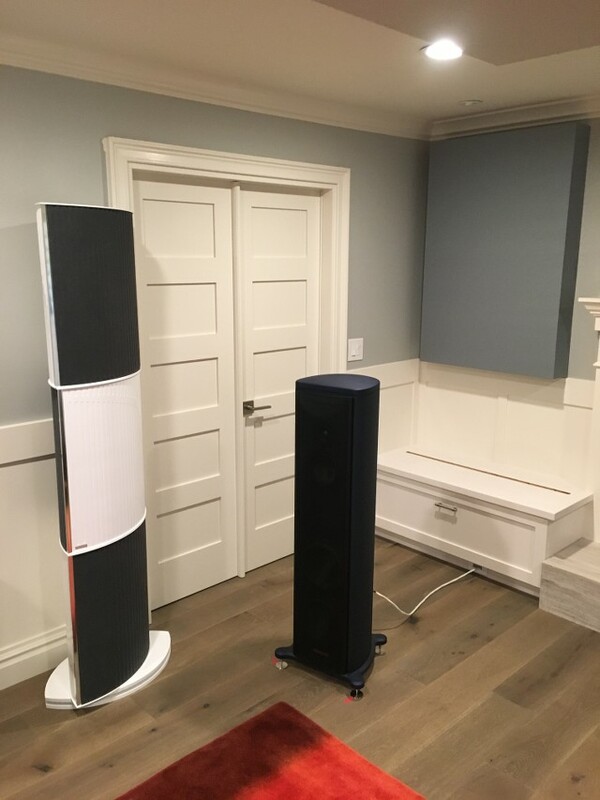 Finding a new home in the right location and condition and for the right price is challenging enough in Silicon Valley, let alone trying to find one that also includes a workable space for a high end audio system. 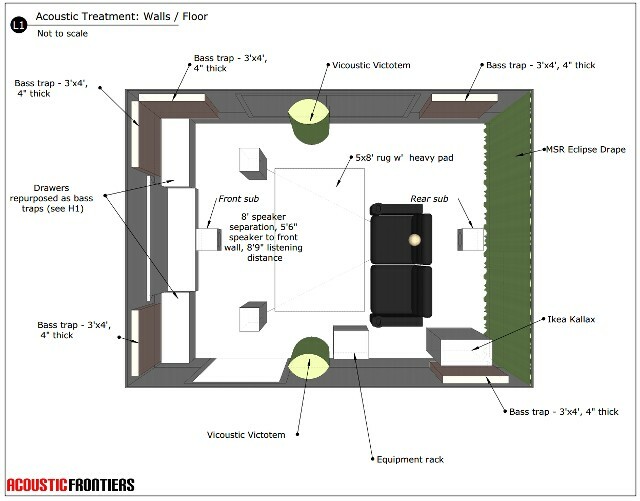 Acoustic Frontiers were contracted to assist in the transformation of a moderately sized room off the main entrance into the home into a dedicated listening room. The initial visit found a space with potential. Key resolvable issues were an opening into the kitchen on the left side wall that we recommended be filled with a door, and an opening into a double height hallway on the back wall. There were of course some aspects of the room that were less than ideal such as the wall / ceiling construction which used 1/2″ gypsum board with no insulation, and a large window along the right side wall. Our acoustic treatment design incorporated a number of high performance bass absorbers – the RPG Modex Plate – together with an absorptive / diffusive Eclipse drape from MSR for the rear wall. Drawer units each side of the fireplace were re-purposed into Helmholtz absorbers. We intentionally left most of the lateral early reflected field in the room reflective to create a spacious and enveloping sound, adding an area rug and large ceiling mounted Arithmetic Design Absorb | Select 2D hybrid absorber / diffuser to prevent the room being overly live. Vicoustic VicTotem freestanding acoustic panels added control of the immediate lateral side wall reflections. The acoustic treatment design for the ceiling incorporated bass trapping and hybrid absorption / diffusion to balance the lack of absorption in the room. Acoustic Frontiers provided a JL Audio Fathom F112 for the project, which we positioned behind the listening area. The Magico S3 mkII speakers were actively crossed over using settings determined during system calibration and implemented in the Devialet D440 monoblock amplifiers. The subwoofer was used primarily for active room mode cancellation of the 1st axial length mode, with a secondary benefit of providing fill for the left/right speaker boundary cancellation from the rear wall bounce. 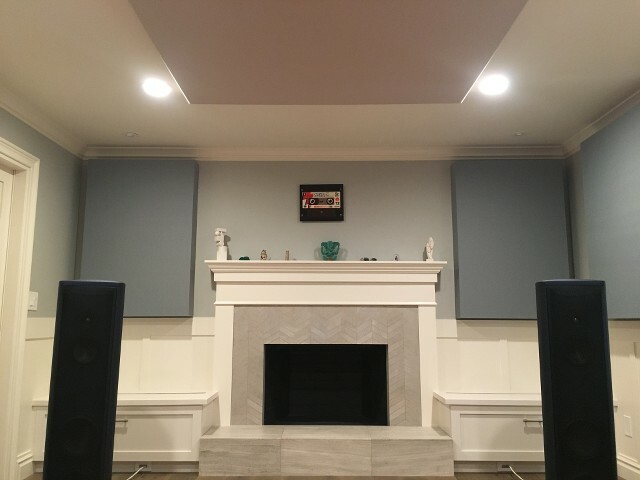 View towards the front of the listening room showing the RPG Modex Plate bass traps and the Arithmetic Design Absorb | Select 2D hybrid absorber / diffuser panel on the ceiling. Vicoustic VicTotem side wall absorber / diffusers. It’s challenging to find freestanding acoustic panels that look good and are not just broadband absorbers. “I worked with Nyal in designing our music room. Given that we did not have a dedicated room for this, the plan was to adapt the formal living room for this purpose. 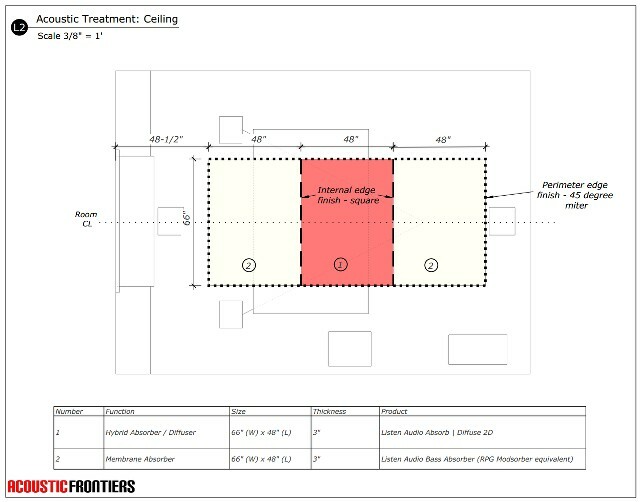 I was very impressed by the creative and data driven approach that Acoustic Frontiers adopted to design the space and transform it to a great sounding room” Mr. Menon.